Test Computers was founded in 1994 in Agios Dimitrios, Attica, by IT executives with extensive experience in business technology solutions. Initially, the company was engaged in reselling of large IT products, PC building, networks installation and in selling and maintaining of enterprise computing software (ERP, CRM). From 2010 onwards, the young generation took the lead and actively involved in software development. Now, having developed dozens of applications and implemented complex projects that include both hardware and software, Test Computers is ready to respond to any challenge. The experience of its executives, their significant expertise in modern technologies and continuous effort to innovate makes Test one of the best companies in the field of High Technology. 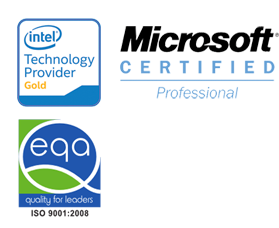 a “Gold Partner” of Intel having the “Intel Technology Provider Gold” certification. an ISO certified Company (ISO: 9001:2008).